Columbia, Mo. 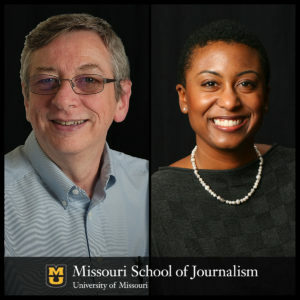 (March 22, 2017) — As initiatives and collaborations continue to grow at the Donald W. Reynolds Journalism Institute at the Missouri School of Journalism, Executive Director Randy Picht announced a key promotion and a new addition to RJI’s leadership team. Mike McKean, RJI’s director of the Futures Lab and an associate professor, moves into the newly-created position of RJI Associate Director. He helps oversee many of the ongoing partnerships, projects and RJI’s cornerstone initiative, the RJI Fellows program. McKean has already started in his new role. “Mike is the perfect person to blaze this trail. His 30 years of experience at the school, terrific management skills and outstanding problem solving all will come in handy at RJI as we continue to make journalism better and stronger,” Picht said. The new addition is Ebony Reed, executive advertising director at the Boston Business Journal and former director of business development for local markets at The Associated Press. She will assume McKean’s responsibilities in the Futures Lab, which conducts research, shares insights and develops new tools and strategies to strengthen journalism. Reed’s new title will be Director of Innovation and the RJI Futures Lab. Her appointment is effective April 15. “Ebony has been successful wherever she goes, from the Detroit News to the American City Business Journals, and that largely is a result of her enthusiasm for journalism, her curiosity and creativity as well as her determination to see things to the finish line,” Picht said. Reed also will join the Journalism School faculty as an associate professor. She has been an instructor in the online master’s degree program for a decade and formerly served on the board of directors of the Columbia Missourian. Both McKean and Reed are graduates of the school. McKean earned his Bachelor of Journalism degree in 1979. Reed earned her Master of Arts degree in 2004. RJI opened its doors in 2008 with the mission of strengthening democracy through better journalism. It serves as a research and development hub for the Missouri School of Journalism and forms close collaborations with industry partners that often leverage the enthusiasm and expertise of students and professors. Trusting News, a collaborative project with 14 newsrooms around the country that features nearly 500 ideas to test. RJI launched Trusting News in an effort to help news organizations regain the trust of their audiences, which the most recent Gallup Poll indicated was at an all-time low. Bot-driven engagement, which a current RJI Fellow is using to help newsrooms gather news and engage with readers. Each year, the fellowship program has funded four to 11 innovative ideas to help the industry grow and get smarter.